I first laid eyes on this impressive stallion as a yearling playing in his paddock. It was an instant attraction and I asked if, in the future, he would be standing at stud. The plans were that he was destined for France, and would not be available for Australia. Bred by Jeff McGlinn of Mystica Arabians, this beautiful bay colt was Mystica Abbas, sired by the stunning Magnum Psyche (Padrons Psyche x A Fancy Miracle) son LC Prince Magnum (ex Ludy El Shahller HMR) and out of one of my all-time favourite mares Princess of Marwan (ex Amety B), sired by the living legend Marwan Al Shaqab (Gazal Al Shaqab x Little Liza Fame). He was the image of his dam, with her beauty, coupled with a smooth body, amazing hip and hindquarter, fabulous movement and balance so well known from his sire lines. He had it all, including a world class pedigree that is sure to breed on. I was just blown away with his bloodlines and he was such a special colt. I saw so much potential for Abbas as a breeding sire and future show horse. I could not forget him, and knew we had to have him. Fortunately for us, he was not sold overseas and after some negotiation, Abbas now has pride of place here at South Serenity Arabians. I would normally start a young stallion with a halter career. However, we had great visions of him being a super saddle horse, and thus Abbas was allowed to just grow and mature at home. Just before he was three, he was backed by the very talented rider Elouise Lando and then turned out. They formed and incredible bond and this winning combination was poetry in motion. Now four, this young stallion with a beautiful, kind temperament and his balanced, beautiful movement and trainability, has exceeded all our expectations. His first two shows saw Abbas win Champion Newcomer and Champion Ridden Arabian Stallion. His third show at the Victorian Arabian Classic, he won the Champion Newcomer Champion Novice Champion Intermediate and Champion Open Saddle horse. Then being awarded Supreme Novice of the Show, Supreme Intermediate of the Show, and Supreme Open Saddle Horse of the Show – a feat that no other horse has accomplished before. 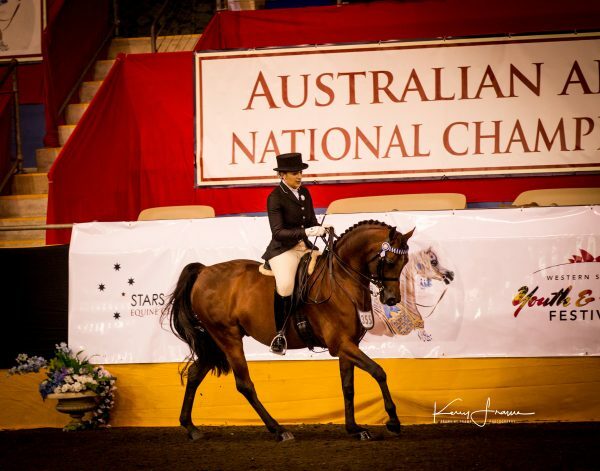 After this stellar win, Abbas had a few weeks of rest and relaxation before preparing for the two major shows here in Australia – the East Coast Arabian Championships and the Australian National Championships. Mystica Abbas. Credit Kerry Frame. East Coast was again beyond any expectation for a four-year-old newcomer but Abbas won the Champion Bridle Path Hack, Champion Show Hunter Stallion, Champion Ridden Arabian Stallion, and the prestigious Young Horse Snaffle Bit Challenge. The last show was the Australian Arabian Championships, competing against the best in the country at this most prestigious show of the year. Abbas took centre stage and after his amazing show record, all eyes were on him. Elouise rode him to perfection, and Mystic Abbas was sashed Australian Arabian Gold Champion Ridden Stallion. We have a few select mares in foal to him and eagerly await his first crop of foals at South Serenity Arabians. He has been bred to the beautiful Mystica Maliha (Maharaja HDM x Shakla’s Precious Moment), Bremervale Estelle (Desperado x Bremervale Kiri) and Kameo MI (Konfidence MI (by Klass) x Love Potion M). Mystica Abbas is a dream come true. In the short saddle career he has had, he has followers all over the country excited to see what the future holds for him both as a breeding sire and in the future as a show horse. 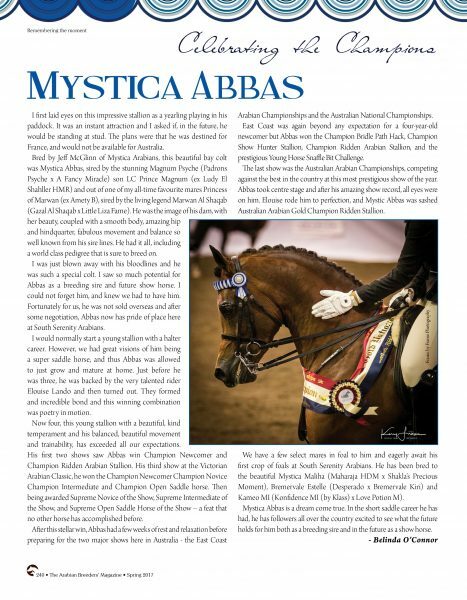 Previous articleThe Arabian Breeders’ Magazine: Celebrating the Champions – EKS Alihandro. 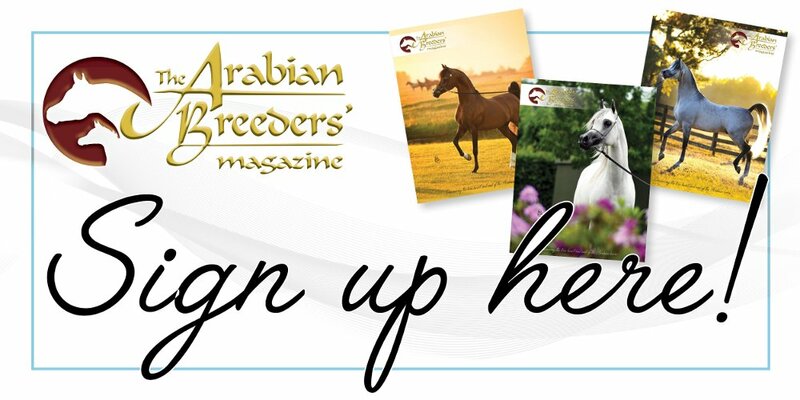 Next articleThe Arabian Breeders’ Magazine: The Breeders Interview – Georgian Arabians, UK.